Flavor Variation: for Creamy Mexican Fiesta Skillet, stir in 1/2 cup sour cream with the soup. 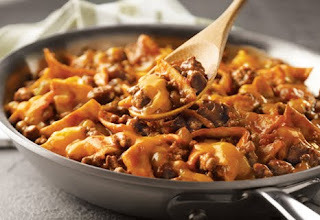 Flavor Variation: for Ranchero-Style Skillet, use corn tortillas instead of flour tortillas and shredded Mexican cheese blend instead of Cheddar. Serving Suggestion: Serve with a mixed green salad with Italian salad dressing and corn on the cob. For dessert serve a store-bought flan.